Keithing up with the Twins: Counting Down To When? Yesterday I reached a point of discomfort that is incredibly hard to describe but I will try my best. 34 weeks with twins was a marker I always wanted to get to, and now that I'm here, I'm not sure what point to look to next. It seems crazy to me that they could be here tomorrow, or in 3 weeks. It sometimes can feel like they will never get here, even though that is crazy and I am closer now than ever. I feel, and physically look like, a ticking time bomb. I never thought I would get winded standing for 10 minutes, have to take a sitting break after putting on my shoes, move a stool up to my bathroom so I can get ready sitting down but now that I am experiencing these things I have never been more thankful for the people in my life. I just wanted to thank everyone who has helped us out in so many ways- you are all so appreciated. I don’t know how I would have gotten to this point without you. Special shout out to my mom and Mary Faust for coming over this weekend and cleaning my house, washing baby bottles and helping make sure we are all ready to go in case they make their appearance this week! 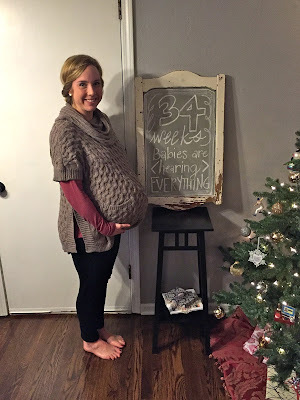 The contractions (Braxton Hicks) have slowed down, as I am only experiencing about 3-5 a day for the past few days. It’s frustrating to say the least. I went from >15 a day to that and I can’t help but think it’s a step back. My next appointment is Tuesday and I am hoping to get some news that we are progressing. I will have a sonogram for growth and BPP, which stands for Biophysical Profiles on both of the babes. They measure their breathing, fetal movements, blood flow, heart rates, etc… Each babe has to pass within 30 minutes and both times they have! If they don’t, I think they hook me up to the fetal monitors and we monitor them. I cannot wait to see how big they are! Updates will come then. Below are the pictures from the 3D BPP from week 32.
e m m y l o u: She was bigger than Bennett last time they were measured. 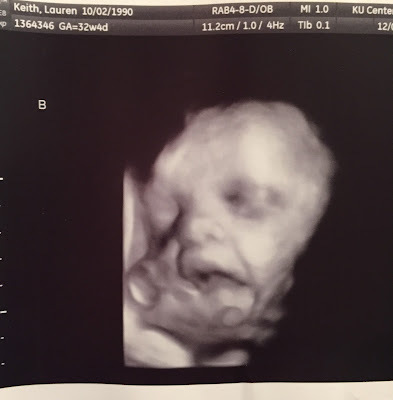 You can see her little hand up by her face and an open mouth. She is my feisty little girl, always kicking her brother and moving all over my abdomen. 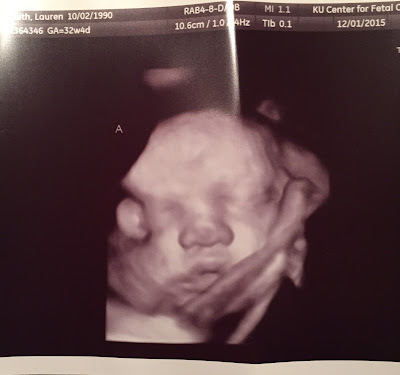 They were even able to see she has hair, which explains my very irritating heartburn. I love her tough girl attitude already. b e n n e t t: My sweet, calm little guy. I think this picture looks JUST like Alex. Like I said before, he has been measuring smaller than his sister but I think he may be catching up, or at least my lower abdomen feels like it. Being that he is lower in my abdomen, he will most likely be born first and has been holding his sister up most of the pregnancy, without any complaints at all. I can't wait to snuggle those little cheeks. ***Hold your breath, this may get a bit cheesy here, but I have to. Where to begin. I could not have imagined doing this pregnancy without him. The thing they don't tell you about being pregnant, that I have had to learn on my own, is you have to pretty much give up a lot of the things you normally take for granted. For example, every night before bed, Alex will make sure I am positioned right. This sounds easy on paper but it's a struggle trying to get the right amount of pillow support to try and ease the back pain, hip pain, shoulder and neck discomfort, heartburn, indigestion and rib kicks from my girl Emmy, etc. And once you get positioned (one pillow behind my back, another supporting my belly, one between my legs) you realize, "I have to pee." And he lifts me out of bed, helps me to the restroom, waits for me patiently and repeats the entire process. This man is one of the most selfless people I know. Many nights I have woken up moaning from pain and his response? "What can I do for you?" Said in the most eager of ways. He is ready to jump out of bed and get an ice pack for me or TUMS when my stomach is being pushed up to my heart. He does it all with a smile and a positivity that makes this tough journey easier on me. I have always been a do-er and a fix-er and to give that up and let someone take care of all your needs, well it’s pretty damn hard. I can wake up from the most restless night’s sleep, looking rather, ragged, and he tells me I look beautiful, almost like Ive taken his breath away. I know I look tired, with bags under my eyes and I look strained from the rough night’s sleep, yet he doesn’t see any of that. I am so in awe of his utter lack of frustration and unending patience for me. Alex, you are my strength, you are the person who has seen me at my most vulnerable and still loves me like crazy. He makes me laugh, comforts me the best he can, ties my shoes, kisses my belly, prays over me and looks at me the same way he did on our wedding day. I cannot thank him enough. He already is such an amazing father and an incredible husband. May have shed a few tears on that one. Not surprised at all by Alex's support. Such a solid guy. So proud of you both!! !